MANIFESTO making, as a rule, is an exercise in offering the moon, even if what you have in the kitty looks more like a quarter. It is for the voter to decide what is real and what is maya. The latest to undertake this visualisation task is the Congress whose manifesto offers an exceptionally large bag of goodies. There will be no new taxes and one crore jobs every year. THE assassination of Hamas co-founder and spiritual leader Sheikh Ahmed Yasin on Monday by the Israelis is bound to cause retributive suicide bombings by Palestinian extremists. Prime Minister Ariel Sharon, who himself monitored the missile attack at the religious figure at Gaza, has done no service to his countrymen. The Israelis need peace more than anything else. A PIECE of good news for those wanting to kick the bottle may turn out to be bad news for the political class trying to sell “feel good” as a mantra for electoral success. Researchers have found that the feeling of euphoria or “feel good” is a trick that is played upon the mind by a mischievous chemical. THE present government in Jammu and Kashmir is a coalition of parties representing divergent regional aspirations. The base of the People’s Democratic Party is confined to Kashmir region and that of the Congress mostly to the Jammu region, while the Panthers Party exclusively represent Jammu and Independents Ladakh. THE late Taroon Coomar Bhaduri was a legendary Special Representative of The Statesman. His book Chambal: The Valley of Terror bore proof of his prodigious narrative skill. All-time dreadful dacoits Man Singh and Madho Singh and the mother of banditry Putli Bai came alive on the pages of his book. DESPITE the 11-month long thaw in Indo-Pak relations, Pakistan is still denying India a corridor to Afghanistan for transporting men and material as aid to the Hamid Karzai government in Kabul. IT’S A widely held belief in Taoist circles that, on a psycho-emotional level, problems with your back represent unresolved issues you’re trying to put behind you - and this is especially so with the buttocks, as they provide the seat for all that’s gone before. MANIFESTO making, as a rule, is an exercise in offering the moon, even if what you have in the kitty looks more like a quarter. It is for the voter to decide what is real and what is maya. The latest to undertake this visualisation task is the Congress whose manifesto offers an exceptionally large bag of goodies. There will be no new taxes and one crore jobs every year. Privatisation will be selective and the economic growth will be between 8 per cent and 10 per cent. Feel good? The Congress says you certainly will if you elect it to power. Its sleek manifesto is targeted towards the audiences which the BJP is perceived to have ignored. So, employment generation is the cornerstone, with the upliftment of the agriculture sector being given an equally high billing. The party takes pains to insist that it was when the party was in power that there was real sheen on India. The country fell back to dark days during the NDA regime but can recover its place in the sun provided the Congress is voted back to power. The interestingly, the old contempt for minor parties stands neutralised. Now there is talk of cooperation with them. Similarly, the ambiguity on the nuclear issue has been shed and the party has decided to appropriate it fully as a credible deterrent. At the micro level there is stress on “back to basics”. That means that there will be social harmony, a subject on which the BJP has been strongly taken to task, progress of villages, viable livelihood, economic progress and empowerment of women. You cannot find fault with any of the endeavours except that there is no mention of how such a significant turnabout will be brought about. Asking probing questions about the nitty-gritty of the blueprint on the basis of which so much will be achieved is pointless at this stage. All that the voter is supposed to do is to take the promises at face value. One welcome feature is that the party has promised to present a progress report on the implementation of its manifesto on October 2, the birthday of Mahatma Gandhi. THE assassination of Hamas co-founder and spiritual leader Sheikh Ahmed Yasin on Monday by the Israelis is bound to cause retributive suicide bombings by Palestinian extremists. Prime Minister Ariel Sharon, who himself monitored the missile attack at the religious figure at Gaza, has done no service to his countrymen. The Israelis need peace more than anything else. Mr Sharon’s unwise action has killed the little hope for peace that could be seen despite the hindrances created in the way of implementation of the US-backed roadmap for narrowing the Palestinian-Israeli divide. In fact, it was Mr Sharon who did not allow the roadmap to become a reality by continuing with his policy of targeted killings of Palestinians despite the worldwide outcry against it. The Hamas and the Islamic Jihad, the two principal extremist outfits, had at one time agreed to abandon the path of violence if that could help achieve their objective of a Palestinian homeland. The wheelchair-bound cleric did justify suicide bombings, describing these as the ultimate weapon of the weak. But there is no proof to establish his direct involvement in such incidents. In fact, most people considered him as a moderate in the company of extremists. Over the years, he had grown into one of the tallest Palestinian leaders. Ironically, this is what the Israelis wished him to be when they helped him in 1987 to co-found the Hamas, an Arabic acronym for the Islamic Resistance Movement. But his popularity only strengthened the Palestinian movement, instead of weakening it as expected by the Israelis. It is also true that Hamas has been one of the organisations indulging in terrorism without any remorse, little realising that what it does is the biggest threat to peace today. But state terrorism is no less dangerous. That is why many influential world capitals, including the Vatican, have expressed outrage at the most gruesome murder. The world community should redouble its efforts not only to cool the tempers in West Asia but also to facilitate an early and lasting solution to the festering problem in that volatile region. A PIECE of good news for those wanting to kick the bottle may turn out to be bad news for the political class trying to sell “feel good” as a mantra for electoral success. Researchers have found that the feeling of euphoria or “feel good” is a trick that is played upon the mind by a mischievous chemical. It should be called Puck, instead of CRF. The focus of the study was on how alcohol affects the brain. Further research can prove that all forms of “nasha” generate the same fake sense of joie de vivre that makes Indian politicians feel good. A feeling they want to sell to the voters. The researchers say that alcohol works on the chemical make-up of the brain and generates the “feel good” feeling in tipplers. It tempts people to graduate from social to hard drinking. The same principle makes politicians who have tasted power want more of the same. Munshi Premchand’s story captioned “Nasha” is an exposition of how a simple khaddar-wearing youth gets addicted to the lifestyle of his wealthy friend. The research may help find a cure for alcoholism. Will it be equally effective in curing political “nasha”? What is the chemical make-up of CRF? The full form can well represent C for crime, R for rogue and F for felon. It is this CRF factor that attracts the down and out section of people to the underworld. It could also be a short form for “Corruption Factor” or “Crooked Funds”. Any one variant of the CRF will give the uninitiated a feeling of the “promised” joy. If he gets addicted to all three forms of “nasha”, he should not miss out on the opportunity of joining the political “feel good” bandwagon. Why should anyone in his right political senses accept a line of treatment that would block the CRF from reaching the brain or the masses? As no institutional arrangement or objective norms for equal regional development was made, every step of the government — recruitment and promotion of government employees, allocation of funds for various development projects, relief measures for victims of militancy and so on — was debated on the touchstone of regional equality and found wanting. As it is simply impossible to equate every region on each issue, completely ignoring their merit, needs and priorities and a resort to ad hoc measures widened the regional divide. It is against this background that the issue of permanent residents status of women of the state instantaneously inflamed regional passions; with communal overtones. The opposition National Conference raised a furore over the compromise that the state government had made on the identity and autonomy of the state by withdrawing its appeal from the Supreme Court against the judgement of the state government which had rejected the practice of disqualifying women of their status as permanent residents if they married outsiders. In a panic reaction, the government promptly tabled a hastily drafted Permanent Residents (Disqualification) Bill in the Assembly to remove the lacuna in the existing position. It was passed with voice vote without any discussion. But soon it snowballed into a big crisis. As the BJP raised the issue at the national level, the Congress, the major party in the coalition, withdrew its support to the Bill as hastily as it had given its approval. It proposed that the Bill should be referred to a select committee. Demonstrations for and against the Bill started in Srinagar and Jammu. Rarely the politics of the state was so sharply divided between the principal regions and communities of the state. Interestingly, the same facts and arguments are being used on both sides. The Kashmir-based parties — the People’s Democratic Party and the National Conference — describe any criticism of the Bill, including by the Prime Minister, the Deputy Prime Minister and the Congress President, as a threat to the special status of the state under Article 370. Under this Act, the law on the permanent residents of the state as a part of its constitution was enacted, incorporating the safeguards for the citizens of Jammu and Kashmir as provided in the state subject law promulgated by Maharaja Hari Singh in 1927. The opponents of the Bill similarly argue that since Article 370 stood in the way of national integration and gender justice, it should be scrapped. The RSS further called it anti-national and secessionist; as if to tempt the secessionists to rally round the Bill. A senior BJP leader described the Maharaja’s law as a remnant of days of British rule which was no longer valid. These sets of arguments and facts, though complementary, are based on ignorance which generates mere heat without any light. The fact is that neither the state subject law of 1927 nor the Act under the state constitution (after which the earlier law in any case lapsed), provide for the cancellation of the state subject nor for different treatment of men and women. The state subject status of Mrs Ghulam Kabra and her right to inherit property was, for instance, challenged in the state High Court as early as in 1939 on the ground that though a state subject by birth, she had lost that status by marrying a non-state subject. The court held that Ghulam Kabra was the legal heir of the property which she could inherit. Her status as state subject after marriage was not cancelled as there was no promise in the State Subject law to cancel a certificate once granted. Similarly, the provision made in Rule 8 of the Jammu and Kashmir Grant of Permanent Resident Certificate (Procedure) Rules 1968 does not provide any ground for cancellation, not to speak of disqualifying specially women on any ground. It was against such arbitrary and contradictory decisions under an executive order that the state High Court held it to be invalid because (a) it had no legislative sanction and (b) it violated the gender equality clause (of the Constitution of the state as well of India). If the PR (Disqualification) Bill 2004 was allowed to be discussed in the Legislative Council, which was adjourned by its Chairman, it would not have passed, as it could not get the required two-third support. And it could not be passed again in the Assembly as the Congress party had withdrawn its support to it. Even if by some miracle, it could have been passed by both Houses of the legislature, it would have been rejected by a court of law as it infringes the fundamental right of gender equality. Those who insist on arguing that a woman’s status should be determined on the basis of her husband are relying on an archaic and outmoded tradition long discarded by the civilised world and international law. The US Cable Act had held as far back as 1922 that “a woman would retain her pre-marital nationality after marriage.” Other democratic countries followed suit. In 1956 UN General Assembly passed a Convention on the Nationality of Married Women which ensured that a woman’s nationality would not be affected by “either marriage or its dissolution or the change of nationality of her husband.” After this, independent identity of a woman became a part of international law. This principle remains valid with or without Article 370; whether the state becomes just like any other state of India or even acquires a sovereign status. The Law Minister gave a very queer argument when he admitted that “the females all around the globe are subjected to biological, civil, political, social and legal discrimination and subjugation.” But, according to him, the right to preserve ethnic identity was guaranteed under international law. Secondly, he asked: where was the question of discrimination when the outside women who married citizens of the state were given the status of permanent resident? His arguments rest on the notion that in both cases the status of women was determined by that of their husbands. Outside women have as much right to maintain their pre-marital status after marrying citizens of the state as the women of the state have to maintain their pre-marital status after marrying outsiders. Further, in order to maintain the purity of all ethnic identities, it is equally important that all men who marry outside women should be disqualified as permanent residents of the state. That would meet the requirements of the Constitution of the state and the modern concept of gender equality. For, a complete ban on inter-ethic marriages within or outside the state would, again, not be permissible under the Constitution that the state has adopted. Ironically, the bogey of autonomy of the state is being raised by those who were mainly responsible for its erosion, constitutionally and politically. But by isolating Kashmir from the liberal opinion of outside the valley, they are not making its autonomy and identity securer and are doing great disservice to the cause of the Kashmiris. What struck me most about Bhaduri were his proverbial memory and eye for details. I had occasion to cover several Press conferences with him but I never saw him taking any notes whatsoever. Yet, his reports would have interesting tidbits which most other reporters would have missed. Bhaduri was fond of narrating an anecdote. He was for a while posted at Gangtok, i.e., much before B.G. Varghese wrote that famous editorial in The Hindustan Times , “Kanchenjunga Here We Come”, in which he concluded, “If it is not outright annexation, it comes close to it” lambasting Indira Gandhi’s decision to change Sikkim from a Protectorate to the 22nd state of India. Instantly, Varghese became a liability for the proprietors of the paper eventually leading to his dismissal literally from the corridors of Hindustan Times House. But when Bhaduri was in Gangtok, Chogyal was in command in the Himalayan state and his palace was where the Occident and the Orient cohabited. Little did Bhaduri know that the perfect host that Chogyal’s American wife was, she would leave him and the country the moment her husband lost his Kingdom when an overwhelming majority of the people voted in favour of Sikkim’s merger with India in a special referendum. When Bhaduri was transferred out of Gangtok, Chogyal gave him a farewell dinner where all the diplomatic corps and senior officials were present. So overwhelmed was Bhaduri that he too invited Chogyal and his wife for a reciprocal dinner to which he invited everyone who attended the previous dinner. The bill came to Rs 18,000, a princely sum those days and he sent it to The Statesman, which unquestioningly sent him a demand draft for the same amount. He told this story to drive home the point that his paper treasured its special breed of reporters known as Special Representatives. Bhaduri was too senior in the profession to be my friend at that time. The first time we spent some time together was at the Bhopal Junction. As usual, the train was late. Restlessness was writ large on the tiny tot clutching at his finger. Amused by the difficulty he had in controlling his grandson, I asked him why he did not take a flight, instead. “I can’t afford a flight, though he can, perhaps” he said pointing to the child. Bhaduri introduced me to the child. We instantly clicked. I took him for a walk on the platform, showed him a stationary steam engine and bought a chocolate for him. By the time the train arrived and Bhaduri and his grandson boarded the first class compartment, we had become friends. As providence would have it, I never met the boy afterwards, though I spent a couple of days with Bhaduri when he came to Patna in the mid-eighties to look after his brother, who had undergone a serious operation in the city. Two and a half decades later, I saw Bhaduri’s grandson again — at Chandigarh ’s Fun Republic multiplex when I saw the film, LoC. He had grown into a tall, handsome young man and was known by the name Abhishek Bachchan. Authoritative sources in the Government of India have told The Tribune that the bonhomie between New Delhi and Islamabad has meant nothing when it comes to Pakistan’s Afghanistan policy, which essentially means preventing India from making any strategic and diplomatic gains in Afghanistan. The Vajpayee government has pledged a $270 million aid — nearly Rs 1,300 crore — spread over 2002-2006. A crucial part of this aid package is 400 Tata and Ashok Leyland buses, which India is in the process of sending to Kabul. The Indian buses are a runaway hit among the Afghanistanis and have transformed the lifestyle of the locals in the capital, Kabul. Sources said as many as 274 buses had already been gifted to Afghanistan but a problem had cropped up on the delivery of the rest of the 126 buses. As many as 2,000 people commute daily in each of the Indian buses which means that after India were to fulfil its commitment of supplying all 400 buses to Afghanistan, these will directly benefit nearly a million Afghanistanis daily. The 274 buses already plying in Afghanistan were sent via Pakistan. But since March last year, Pakistan has refused permission for use of its territory as a transit route for Indian aid to Afghanistan. A significant fact here is that the Government of India has never broached the topic with Islamabad and it is the Hamid Karzai government which has been entreating the Pervez Musharraf regime to give the required permission for Indian buses to reach Afghanistan. Pakistan’s response has been characteristically unifocal: have friendship with us, not with them. Sources disclosed that after a year-long failed negotiations with Islamabad, Kabul has finally thrown up its hands and conveyed to the Vajpayee government about the “rigid” attitude of Islamabad. In view of this, the Vajpayee government has decided to send the remaining 126 buses to Aghanistan via Iran despite the fact that this circuitous route would significantly increase the transportation costs. India had to do a similar thing last year when Pakistan refused use of its territory for transporting a tranche of one million tonne of Indian wheat to Afghanistan and New Delhi had to honour the commitment by grinding the wheat to flour and converting the flour into high-protein biscuits to save on transport costs. A pertinent question that arises is: why did Pakistan allow 274 Afghanistan-bound Indian buses to transit through its territory in the first place? Why has it blocked similar permission for the remaining buses? Sources pointed out that Pakistan did not realise until early last year what kind of impact the Indian aid to Afghanistan was making. India moved into Afghanistan quickly in the wake of 9/11 after the Taliban regime was ousted in the US and UK-led “Operation Enduring Freedom”. The massive Indian aid to Afghanistan covers every conceivable activity and touches every single province of the landlocked country. 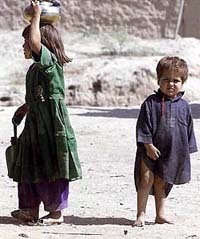 Apart from financial and humanitarian assistance, the Indian aid to Afghanistan covers such diverse areas as health, civil aviation (aircraft, spares and services), transport, food aid, education, diplomacy, culture, heritage, media, sport, security services, judiciary, agriculture, information technology, banking, commerce, urban development, infrastructural development, telecommunications and cartography. Sources said one reason why the Afghans were clamouring for more and more Indian assistance was because, being a developing country itself, India knew exactly what was needed in Afghanistan. “Only the wearer knows where the shoe pinches. We know aid problems and requirements unlike the developed countries which deal with the Afghanistanis through intermediaries like NGOs. We deal directly with the Afghan government. Moreover, there is a little wastage in high salaries,” a senior official said in New Delhi on the condition of anonymity. IT’S A widely held belief in Taoist circles that, on a psycho-emotional level, problems with your back represent unresolved issues you’re trying to put behind you - and this is especially so with the buttocks, as they provide the seat for all that’s gone before. The more humiliating the original event that now lies unresolved and buried in the past and the musculature of your back, the further down you push it; therefore it stands to reason that your buttocks are where you hold your worst memories, especially those formative instances where you were rounded on by an angry adult and smacked, caned or worse. The musculature of your buttocks is intimately entwined with your pelvic region, whence your generative force issues forth, so the more loose and relaxed you let them swing, the more energy you’ll have at your disposal. Tight buttocks lead to a restricted flow of generative force, which not only weakens your libido but reduces overall health and makes you feel depleted and nervous. Awareness of this was brought home to me the other day via an Estonian baroness I know, unquestionably the most talented massage practitioner I’ve encountered. She was taught as a child by her grandmother in a style I’m sure must have originated in China and travelled to Estonia along the ancient trade routes. It closely resembles the Chinese kneading and pinching massage known as tui na and similarly focuses attention on the buttocks and hips. The baroness was also taught that unresolved shame and humiliation, plus an unconscious bogus urge to punish yourself for it, is stored in your buttocks. Though she spends a long time working with her improbably strong hands through all parts of the back and sides, she spends twice as long working on the buttocks, something I can confirm is one of the most pleasurable experiences on the planet - in a totally non-sexual way - and one you can become addicted to if not careful. I haven’t been careful and tend to make an appointment to get my fix with compulsive regularity. She jokingly refers to the experience as Baroness’s Buttock Heaven, and she’s not overstating it. Today I’ve found myself walking down the street with an entirely new sensation in my buttocks. My hips feel loose and my energy is flowing strongly. I feel I could run a thousand miles without tiring but, more importantly, I feel lighter at the very core of my being - more self-accepting, as if I have less to feel intrinsically ashamed about. In light of the benefits received, I want to share the Baroness’s Buttock Heaven state with everyone, so that your generative force flows more powerfully and gives you the inner strength to live to a ripe old age. Stand with feet shoulder-width apart and knees slightly bent. Reach behind you with your right hand and press in to the centre of your buttock with your fingertips. Using a brisk, energetic yet sensitive side-to-side movement, vibrate the buttock muscles with gusto for at least 30 seconds. God is great. None but He alone knows how great He is. Evolution does not mean merely addition of some new principles to those which are already existent, but it means that the old principles, by reason of the emergence of the new ones, change their character. Three things are characterised by secrecy: love affairs, priestly wisdom, and all aberrations from the path of truth. The soul is eternal and its actions are also cyclically eternal. The action and the actor are inseparably connected.